Ah, Outback Steakhouse, my favourite spot for steak and other western cuisine. This time around, I was back there again to try out some new yummy offerings on their menu. The outlet in Nu Sentral has always been my favourite as it's easy to get parking, plus the staffs are super friendly, always accommodating even when I bring along the whole family with two kids. Shown above is the new Farmer's Fresh Strawberry Salad, a rather refreshing vegetable salad with a twist. 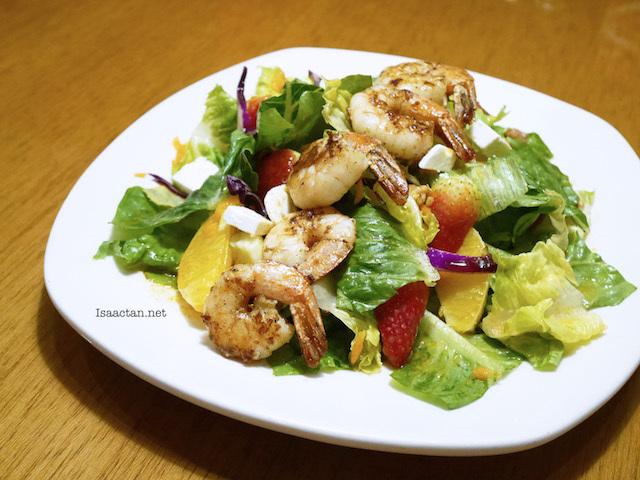 Tossed with orange vinaigrette, we had a combination of lettuce, strawberries, segmented oranges and cucumbers inside topped with some really nice freshly frilled shrimps. 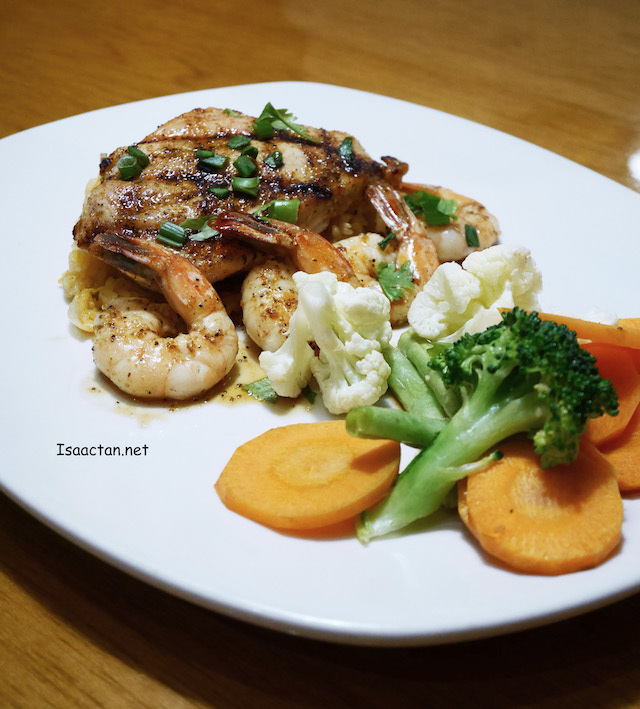 Love how the fresh and juicy shrimps complemented the healthy flavours of the vegetables. 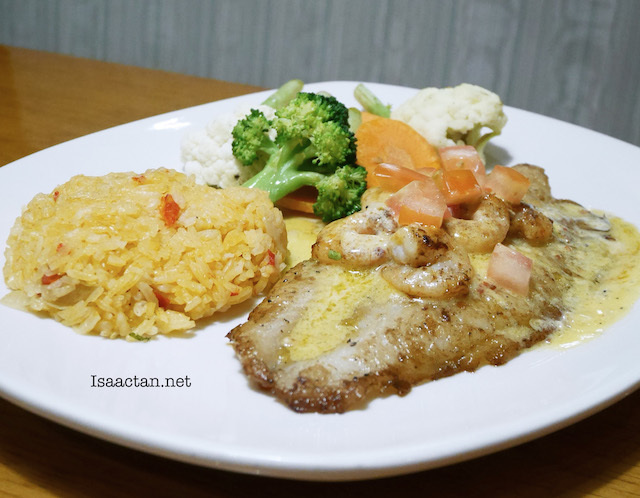 A tasty savoury offering, the Scampi Topped Grilled Fish comes with fluffy seasoned rice pilaf on the side together with some garden vegetables. I find this dish to be a tad oily though, but that's attributed to the flavourful garlic butter sauce on top of the grilled fish fillet. Adding the shrimp scampi was a nice touch indeed. Is it shrimp day today? Yet another almost similar dish appeared on our table next, the Sweet Chilli Chicken and Shrimp. Perfect grilled chicken, which came out being really tender and juicy, not hard at all. The shrimps atop the piece of chicken went well with the rice. Not bad at all. My favourite kind of meat, in burger form, what more can I ask for. 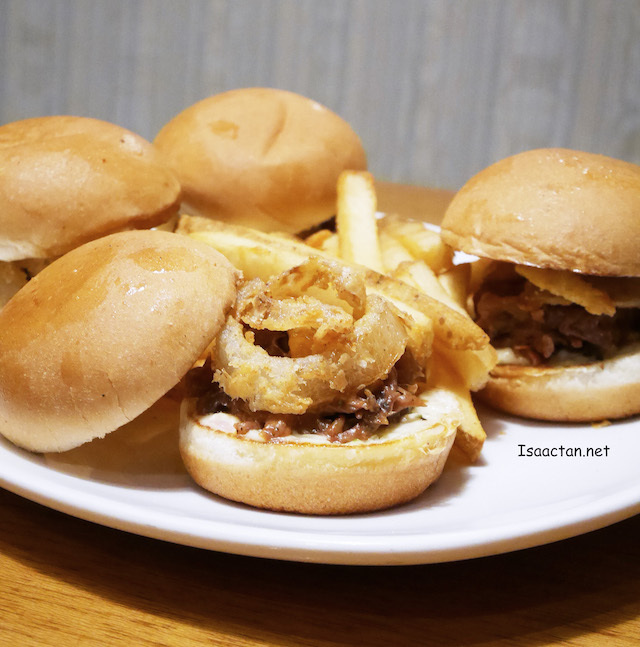 Outback Steakhouse serves these really delicious Short Rib Sliders, slow roasted braised beef short rib sliders topped with peppercorn aioli and fried onion strings on toasted brioche. Served with generous amount of Aussie fries, this is a rather heavy meal for one, so do remember to share. My favourite that night, the Black Peppercorn Crusted Rib-eye. I do love a good piece of steak, especially ribeye. If in doubt, always go for the ribeye, as it always satisfy, with the soft fatty bits complementing the textured part of the steak. 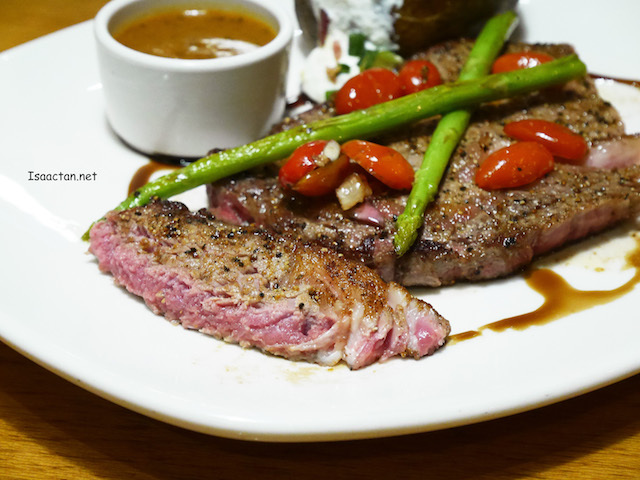 All beef served at Outback Steakhouse are grain-fed, hence the meat tastes better, and has a softer texture. 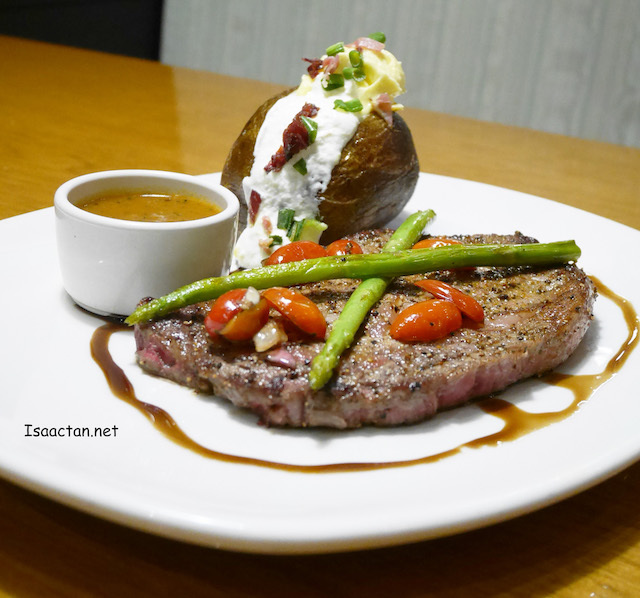 Served with grilled asparagus, loaded baked potato and balsamic sauce drizzled beautifully around the dish, this seared peppercorn crusted ribeye accompanied with peppercorn cream sauce went really well with my palate. I could have all 10oz to myself! Desserts have been the part where I loved most about a meal, and here Outback did not disappoint when we were served with their signature dessert, Chocolate Thunder from Down Under. Chocolate what? Well, I was intrigued by the name as well. 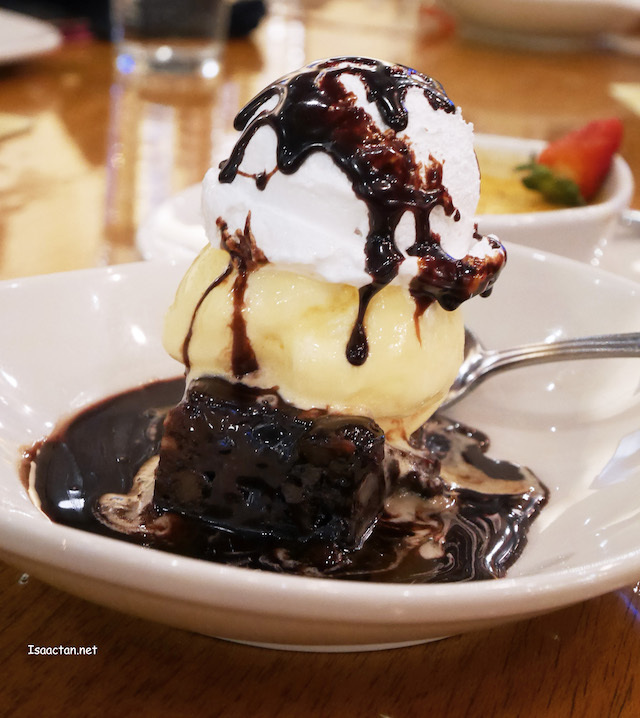 Fresh-baked pecan brownie is crowned with rich vanilla ice cream, drizzled with classic warm chocolate sauce and finished with chocolate shavings and whipped cream, you can never go wrong with ordering this dessert. Same menu at their Bukit Bintang outlet, I guess? "Medium rare" catches my eye-ball, it's so tempting!